She's busting out of the pen! Just don't make eye contact with her. It's been said that if you stare into her eyes for too long she starts to go a little crazy. Become an insane inmate when you wear this Crazy Wig. 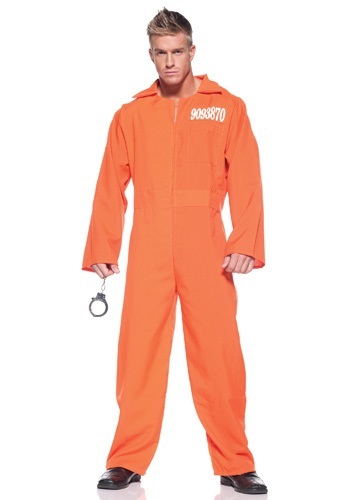 When you put on prison jumpsuit, it's like wearing a sign that tells the world that you plan on doing some crazy stuff at the party that will, most likely, end with the cops putting you in jail. When they get to the party, they'll know exactly who to lock up in the slammer - the guy wearing the orange outfit with an inmate number on it. Just remember, it isn't an awesome party until someone ends up in cuffs. Being a good girl is kind of boring. Being a bad girl is way more fun. The night might end with you wearing an orange prison suit, being interrogated by the local police force, but that's exactly how you know that you've had a good time. Plus, it's the perfect way to get that cute officer to come chasing after you.